Do I need a GPS SAT-NAV for walking? Do I need a SAT-NAV for walking? You can now track your Dog using a mobile , PC or certain GPS devices. Do check reviews for range , durability, water resistance and subscription fees. How does a handheld GPS (sat-nav) work ? When you switch on your gps, it searches for satellites telling you where you are - this may take up to 2 minutes depending on your location(between houses or trees),what you are doing and sometimes on the weather. One trick to speed up the process is to switch on your device and place it on your car dashboard! To ensure the best reception make sure you are not between buildings or high trees and that you are standing still. When the necessary satellites have been located, it automatically recenters the map around your current position. If the screen is just a blank, it implies that your device is not equipped with a map covering your area or you may have to zoom in. You follow a track (the most common format is GPX) which you have saved on your device. This track will be highlighted in a different colour and superimposed on your map. You tell it to follow your track and it will inform you if you are on or off 'track'. Badly created tracks, ie inaccurate tracks, can give the user the impression that a path is running through a building or a dense forest! Why a handheld GPS for walking? A hand-held GPS device is not an essential tool for walking in a county where footpaths are generally well signed. However, when crossing large forests and open fields or negotiating farms with barking dogs or herds of cows ,the luxury of an arrow guiding you in the right direction is somewhat comforting. It always gives you an ETA and your current position, crucial in case of an emergency. It can guide you through a large town or city and to a specific point of interest,ie a pub,cafe,shop, even a public convenience! Portable Car Sat Navs are only of use if you are NOT following paths or tracks - even then, they are quite awkward to carry around. Most portable car sat navs do not allow you to follow a prearranged route - ie one you have created on your PC. GPS devices for walking enable you to follow circular routes ;they also keep track of the route you have followed showing all possible deviations. These can be viewed on google earth or any other mapping software. What are the best sat-navs / gps devices for walkers? Oregon has a great screen but is unfortunately highly touch sensitive - when you take it in and out of pockets your profile can easily get changed ,affecting your map and settings! 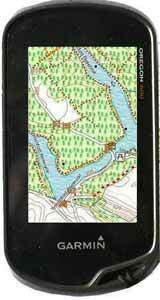 We recommend the gpsmap series. Maximum accuracy is 3m - outside,you are lucky to get 5m. There are more maps available for Garmin devices ( many of them free! ) than any other device. There is a large community of followers keeping Garmin on their toes. Maps can be accessed on your PC / MAC using Basecamp, free and updated frequently.You can plan your routes (GPX files) and save them onto your device. You can change the colours of your maps ,the width of highways etc or the size of your font ( using TYP files) to suit your own preferences - this applies to Garmin devices only! OSM Maps can be updated DAILY to ensure you always follow the most up to date map(s) see Map of Devon. Colours are limited depending on device. Screen size is often smaller than that of a mobile. It has to be said that the initial software of new models is often quirky and bug ridden but Garmin do update their firmware when necessary. Does it show all the public footpaths? Can your GPS find the quickest route from A to B? Does your GPS allow for different routes, depending on whether you are walking, hiking or cycling? Can it avoid busy roads and select a more scenic route? How easy is it to search your GPS for an address or the nearest bus stop,station,pub,shop,museum etc? Only consider devices which receive signals in thick forests! Tracks in dense woods can be very tricky to follow. Look for High Sensitivity, such as the Garmin Oregon & GPSmap64 series Look out for the Oregon 600 with bright colour display or the GPSmap64 - no touch screen but buttons & very accurate. How easy is it to read the screen ? Many devices are hard to read in bright sun light. Check how easy it is to mark a waypoint during your walk for future reference. Some devices are very clumsy. Battery life is important, but most devices should offer up to 10+ hours continuous use.Some have battery save modes. How big is your screen; some devices are very small. How easy is it to negotiate menus with gloves on; are the buttons too small? How expensive are my maps going to be? OS maps are very useful, but after a while limiting. Check how easy it is to transfer a map from an old device onto a new one - at some stage you may want to update your system. Be warned! You more than likely need to buy a map for each (new) device, which in our opinion is quite unacceptable . Free maps are available but only for devices,ie Garmin, which can import img files. Free Openstreetmap maps can be uploaded to your Garmin - see below. All sat navs / gps devices suffer from one problem: high buildings, tall trees & even umbrellas can distort signals. This means your pointer will be 'off road' . Check if your gps device has a 'lock on road' function . All car satnavs are automatically locked . Fundamentally, a GPS needs a map of the area you are walking. Maps can come with the device ; more often they have to be bought separately. A GPS device NEVER comes with a selection of routes/tracks. These you need to create yourself using software supplied with your maps. Alternatively, you can download routes; the most common are in a gpx format. Routes contain a set of instructions from one waypoint to another. Tracks are trails left behind by the walker - they are more detailed and can be more accurate. You use the software to create routes and upload them to your device via a USB connection. Today,this is quite a straightforward process. You can use a GPS without routes/tracks but you will not have an ETA. Some GPS systems come with or can import OS50 maps. Again, footpaths change rapidly in response to local developments. We have produced an OS type map of Devon, suitable for walkers,cyclists and motorists who possess a Garmin Nuvi or any other Garmin device. Check out here. There is another solution but its a bit 'techy'. If you want to upload the latest maps for free and your gps supports 'img' import then we would recommend OpenStreetMap. Such maps are created by volunteers - you could be one of them - and may not include all the public footpaths . Remember , they are free and can be very detailed! Areas can be downloaded and uploaded to your gps. Try our most popular & free mapuploader5.